Motivated gardeners throughout Indiana may grow fruit successfully, with two caveats. First, a fruit tree is a long-term investment, requiring more maintenance than most plantings. Fruit trees also take up more room than other plants and often need a second tree in order to produce fruit. Before planting fruit trees, gardeners should carefully evaluate the amount of time they have available to care for them, and ensure that they have adequate space. The state of Indiana spans over 300 miles from the north to the south, according to Purdue University. Within this expanse, lies a broad range of variations in temperature and climate. Northern Indiana is characterized by cold winters and mild summers. Summer days are warm, with cool nights. Fruit growers in northern Indiana struggle with a shorter growing season and cold winters. Southern Indiana has milder winters, but hot, humid summers. The longer growing season allows southern Indiana growers to produce more. Gardeners in this area face disease and insect challenges due to high levels of humidity. Since growing conditions vary so much, gardeners should consult a local county extension office for advice on the varieties that grow well in their area. Apples generally are good producers throughout the state. Jonafree and Honeycrisp are good choices for the north. Many apple varieties don't perform well in excessive heat, although Golden Delicious is one to try, according to Purdue University. Tart cherries grow throughout the state. Purdue recommends Montmorency, English Morello and Balaton. Sweet cherries are easily damaged by spring frosts and aren't reliable anywhere in Indiana. Peaches and apricots are similarly frost tender. Standard apple trees grow to 30 feet high, making maintenance and harvest difficult. Dwarf and semi-dwarf apple and cherry trees are grafted onto smaller root stocks. These trees grow 8 to 15 feet high, simplifying care. Unfortunately, dwarf trees have shallow roots and are easily wind and frost damaged. They may be short-lived in northern Indiana. Planting and staking the tree in a protected area, and mulching the tree with 3 inches of wood chip mulch may minimize damage. Apples, pears and sweet cherries require a nearby pollinator tree--a different variety that blooms at the same time--to produce fruit. All fruit trees need full-sun and well-draining soil. If soil is clay or poorly draining, amend it with two or three shovelfuls of compost before planting the tree. Water the tree regularly until it is well established and shows new growth. In southern Indiana, frequent rains may eliminate the need to water a mature tree. Northern Indiana summers tend to be dryer. Cherry trees need little additional water; apple trees need weekly watering throughout the growing season, according to Ohio State University. Dwarf trees are especially vulnerable to drought. Choose disease-resistant varieties, especially in southern Indiana. 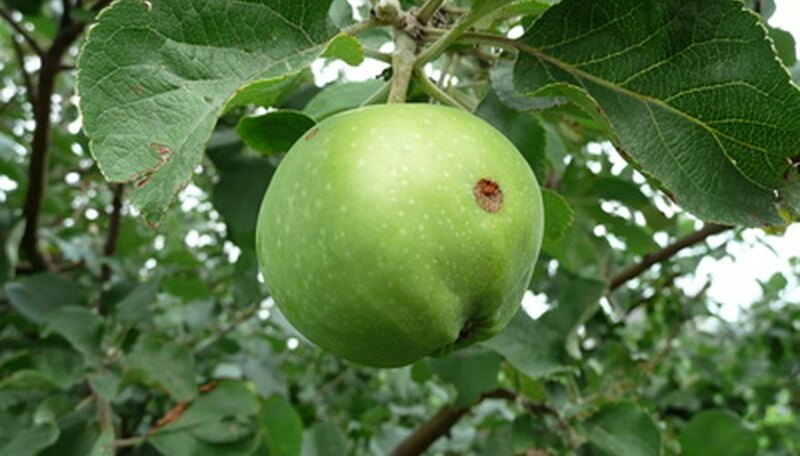 Apple trees are labeled scab or fireblight resistant. Then, use good cultural practices to discourage problems. Fruit trees planted in shady, moist and crowded conditions are more likely to become diseased. Excessive fertilizer can also promote disease. Proper pruning practices improve the health of a fruit tree by opening up the canopy to light and air and removing dead and diseased limbs. Gardeners may find an annual spraying program necessary to control diseases and pests in humid areas. What Climate Do I Need to Grow Strawberries In?